NZDUSD is chiefly under the influence of oil prices and some economic reports such as the US Durable Goods (M/M) and Factory Orders. This pair started today with bearish candles and is getting close to the support level. The support rests at 0.71800 with resistance at 0.72220 which both lines are above the weekly pivot point at 0.71150. The EMA of 10 is rising and it is located above the EMA of 75. The RSI is above the 50 level, the MACD indicator is in positive territory and the Stochastic is showing downward momentum. The price is above the Ichimoku Cloud and the Chinkou Span. The Tenkan-sen and the Kijun-sen are both showing upward movement. 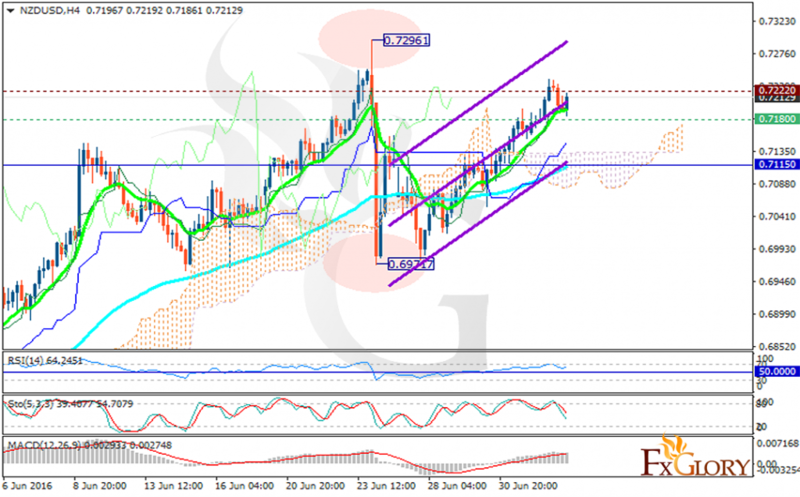 The pair is moving upward so long positions are recommended with the target at 0.7250.